A well-designed website is considered a critically important tool for the growth of any business as well as to create a great impression on their customers. For these reasons, it is the clean, fresh and minimalist design that becomes one of the most outstanding features for us to create an incredible product like Trendmag – our latest HTML Website Template built especially for any kind of shop with stylish design and powerful backend. Always updating newest website design trends, KOPASOFT’s professional staff aim to focus on the simplicity of graphics but still catching your attention at the very first sight. You should no longer be worry about displaying products on the theme because our template features are fully responsive and compatible with all browsers and devices. Additionally, this HTML5 template looks gorgeous with a bunch of fonts from Google’s free collection. Besides that, Trendmag is very easy to customize and packed with the other most useful features that a stunning website needs to have such as Bootstrap CSS Framework, FontAwesome Full Integration (400+ icons), Google Map Integration, Blog Templates, Sticky Menu, Drop-down Menu, SEO optimized, 2 Front Pages and much more. 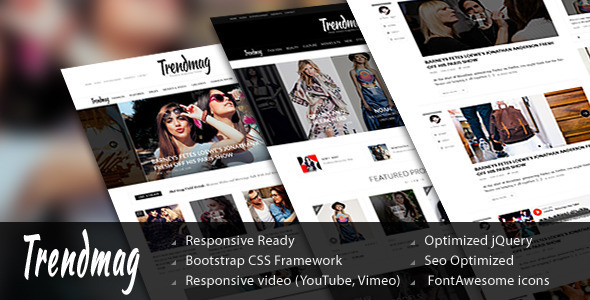 Trendmag will be the wonderful HTML Fashion Template in the path of improving your own business as well as boosting your revenue. Hence, there should be no hesitation in using Trendmag to feel the difference.